Hey Readers… I am here with a comprehensive review of Asus #ZenFone5, which is about to get officially launch on 9th of this July…yeah just after 2 days. With the launch of this smartphone; techies are expecting, Asus will shake the Indian smartphone market very surprisingly. Though I got a chance to use this smartphone just before the launch, I realized it can be the Game Changer for Asus Market Value. As per media and other news sources, expected value of this phone is 15k and I am happy to share the original value, which is just Rs 9999. Is it for Photography lovers? The first impression of this gadget is “Awesome“. If you like the big screen, light weighted yet stylish smartphone then I must say “This ZenFone5 deserves to be your choice”. This Smartphone is coming with 5 inch display with a HD screen resolution of 1280×720 pixels. This sleek phone is lined on the bottom capacitive buttons. You can also see the in above image sharp Metallic strip just below the capacitive buttons and this strip is making this Smartphone more stylish in looks. The right hand side of the device has the metallic silver power key and the volume controller. On top side, I noticed the 3.5mm jack along with the secondary microphone whereas the bottom houses the microUSB port and the primary microphone. If I talk about the curved back design, everyone is liking it. Even though the smartphone body is made of plastic, still the gadget looks classy in hands. Zenfone 5 is coming with display screen, which is safeguarded by Gorilla Glass 3. This new Corning Native Damage Resistance technology increases the life of smartphone screen by decreasing the chances of lateral cracking. I would love to prefer this gadget because of Intel Atom Z2560 processor. Also the gadget embraced with extremely powerful PowerVRSGX 544 MP2 GPU and 2 GB of RAM. 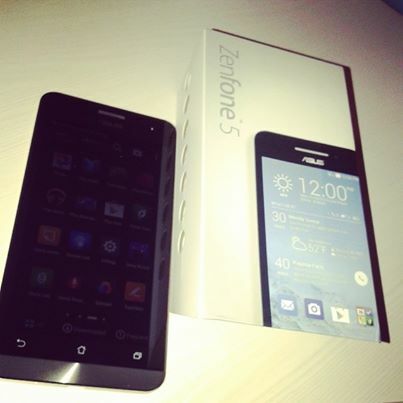 The Zenfone 5 currently runs on Android 4.3, soon this gadget would come up with Android 4.4 as well. This device has all the major features like 3G, Wi-Fi, Bluetooth 4.0 and GPS with aGPS. Non removable battery of this handset has capacity of 2,110 mAh that is made to deliver up to 18.5 hours of talk time and up to 353 hours of standby time on 3G usage. After using Samsung Galaxy smartphone, I realized this Asus & Intel collaboration gadget offers very smooth & fast processing, and this incredible combination has very strong chances to be the most chosen choice of buyers. I love the 8MP PixelMaster camera of this Asus Zenfone 5. This 8MP camera is not just an ordinary camera; this camera is pixel master camera that has many exciting modes to click crispy pictures. The rear camera of gadget offers a resolution of 3264 x 2448 pixels with Autofocus and LED flash. Also it allows you to record high quality MPEG4 videos – 1080p @30fps and 720p @ 60fps. For the people who are self obsessed like me the smartphone has “Selfie” mode to click the most amazing pictures of yours. Front camera of this gadget is accompanied with a 2 MP front-facing sensor that can capture HD 720p videos and stunning selfies. Overall this gadget could be the good choice of photography lovers like me. Sensitive Glove mode – The most unique feature that I ever heard for a smartphone. Reading Mode – If you are the one who hates to read books and loves to read E-books then reading mode of gadget will improve your reading experience. Inbuilt mode to save battery – In normal smartphones we need to download apps for battery management but this phone comes with inbuilt apps to improve battery life. 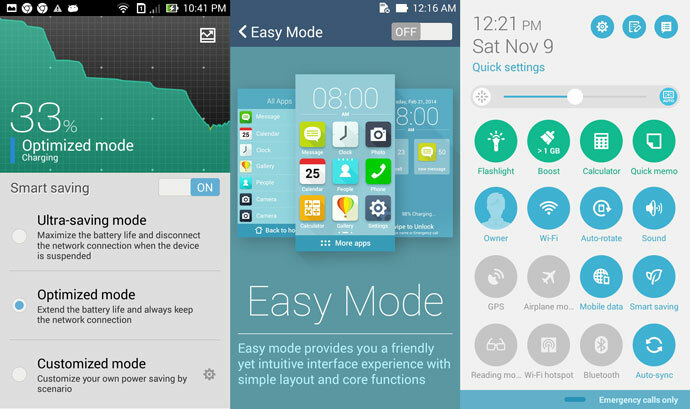 Asus Easy Mode – Add your favorite shortcuts on your Smartphone screen. Also it is user friendly mode. Mirror – Being a girl blogger, I noticed this feature and the mirror offered by gadget is clean & clear. Sound – Uncompromising sound experience as this Zenfone 5 is built with the renowned ASUS Sonic Master Technology. Though the gadget seems impressive to me but still I faced few issues. Might be all because of the particular device, which I received. Wi-fi and Wi-fi tethering was not working in the handset I received to review. Voice controller and power key button on the right side are bit hard to click. Thats a complete and good review about the Asus Zenfone 5. I was searching on Google about this phone specs and cons from about last 3-4 days. But didn’t get any good results. I think this is a complete good package phone by Asus. Thanks for a complete and nice review. Thanks Anshul for the valuable feedback. The mobile configuration looks very good! It has good features and awesome camera. Overall it can be best if its price is little low i.e less than 10k! Thanks for the feedback but don’t you think 10k would be too low? Good one Yogita, happy to read your review, you covered some points i missed. The smartphone indeed is worth using. Though there are some issues you faced, but its just a matter of luck. People are gonna love this technology. Even I love the smooth touch of smartphone. Definitely would love to use this for a long time. Impressive review. Asus is pretty new in smartphone industry and this launch will surely increase it’s market capture. This phone might missing the latest 4.4 (Kitkat) OS, which would be the only area that I think, that it lacks. Thanks for this great writeup though!!! Thanks Frank for the input. No wonder this gadget is the center of attraction these days, for techies. It seems good by its specification. I agree that it could be the game changer for Asus. It’s extraordinary features makes it a disparate from others. This smartphone is getting popularity before the launch … Let see what will happen after launch. 2 days left to launch. Hey Tanya. Just FYI, ‘The Sensitive Glove mode’ which you have never heard about is an old feature and is available on high end a select mid range Lumia smartphones. Ohh, Thanks Akshay for the input. I was unaware with the fact. Thanks Abhinav for the kind words. Definitely a detailed and straightforward review. The 8MP cam and 8g internal storage are what I’m after.